If you are feeling the pinch of the labor market, why not bring in some TV glitz to spice things up and attract talent? 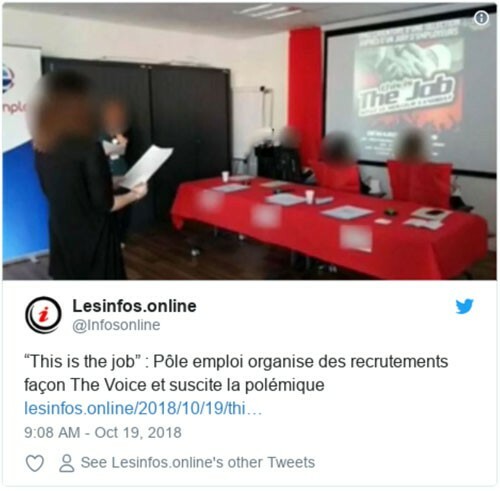 That’s what Pôle emploi, France’s federal employment agency, had in mind when some of its branches began modeling their interviews after auditions on the TV show The Voice. On the show, four famous performers serve as judges. They keep their backs to the stage as they listen to singers try out. If a panel member likes what they hear, they hit a buzzer and turn in their chair, signaling their interest in mentoring the musical wannabes. Similarly, candidates who went to Pôle emploi branches in French towns such as Liévin, Chauny, and Castres faced a panel of recruiters who were seated at a table with their backs to the job seekers. Behind the recruiters was a screen that said “This is the Job,” as though it were the name of a show. The candidates answered questions and if recruiters were impressed, they could spin around and press a buzzer. These competitive interviews were held to find electronics technicians, welders, manufacturing agents, and slaughterhouse workers, among others. The French media published and broadcast stories about the interview panels, which were then criticized in some quarters as over the top. Pôle emploi has shut down “This is the job” and conceded that “taking tools from the world of entertainment was clumsy.” The aim of this approach to hiring, according to the agency, was to spice up the process in the hopes of enticing more unemployed workers to apply for jobs. France has a 9.3% unemployment rate and yet between 200,000 and 330,000 jobs went unfilled last year because companies couldn’t find qualified candidates. Interestingly, the second goal was “to go beyond the CV” and beyond visual first impressions to fight discrimination and other hiring obstacles. The less you know about a candidate’s identity — name, gender, race, age — the less unconscious bias will creep into your hiring decisions. So taking names off applications is now a standard step at many organizations, including Deloitte, Virgin Money, HSBC, and the BBC. There is a growing number of AI-driven predictive hiring tools, impervious to gender, race, and age, that can assess the soft skills and other aptitudes of candidates before they’re invited in for an interview. Some of these platforms, like the one offered by Pymetrics, “learn” the skills and traits of your company’s most successful performers and then screen candidates to find the ones that “look” like your top people. “The more you can figure out what the objective criteria are before launching into the interview process, the more fair and less prone to bias your interview process is going to be,” says Jill Macri, a recruiting consultant and the former the director of global recruiting at Airbnb. Start by meeting with the hiring manager and thinking hard about what skills and attributes are essential to succeed in the open role. And then stick to them and use them as the benchmark for every candidate evaluation. Many companies and schools still embrace the use of unstructured interviews, in which the questions are not prearranged. But decades of research undercuts their effectiveness as a screening tool. In a structured interview, every candidate is asked the same set of questions and multiple assessors take notes and score each applicant at the end. In her 2017 book What Works: Gender Equality by Design, Harvard economist Iris Bohnet advocates for structured interviews as a way to remove gender bias. 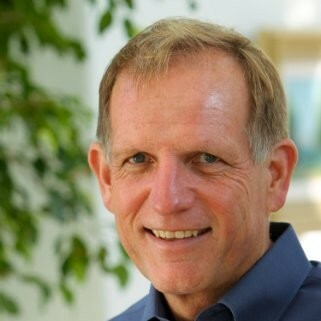 Bohnet and others recommend using scorecards and rubrics to make sure your hiring decision is based on the attributes that were deemed critical before the interviews started. Pôle emploi can replace its buzzers with these four tactics to reduce bias, hire the right people, and elevate the candidate experience. By doing so, it will create a hiring process that is grounded more in reality than TV.